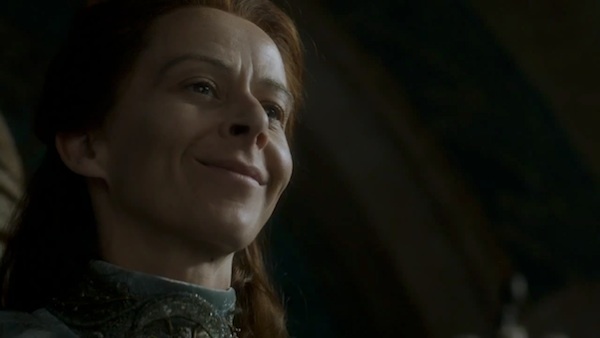 Breaking Bad's Michelle MacLaren directed two back-to-back episodes of Game of Thrones this season. The first was last night's "Oathkeeper," and the second is next Sunday night's "First of His Name." The preview from the episode gives us a bit to work with, jumping from Daenerys, who seems to be growing impatient and ready to take her army to King's Landing, through to a newly crowned Tommen Baratheon, who's already being manipulated by the women in his life, and up to Jon Snow, who appears ready for a fight. Spoilers if you aren't caught up on Game of Thrones through "Oathkeeper"! It's evident that Cersei's going to make an effort to be the #1 woman in her son's life, but the damage may be done. Margaery's proven to have a good way with men and more importantly, sharp intuition as it relates to how far she needs to go to get what she wants. Last night's episode was another demonstration of that, as she sat with Tommen but didn't try to push the situation any further than Tommen would have been up for. At least not yet. And speaking of Starks, it looks like Arya's taking a shot at Sandor Clegane. Needle doesn't seem to be any match for the Hound's armor. And Arya isn't the only Stark on the attack. Jon Snow's fight is on up north! "First of His Name" is the half-way point for Season 4 of Game of Thrones, so it'll be interesting to see how Episode 5 leaves off as we head into the second half of the season. Read our thorough recap of "Oathkeeper" here!. Game of Thrones airs Sunday at 9:00 p.m. ET on HBO.